Origin and Habitat: Angola, Burundi, DRC, Rwanda, Uganda, Kenya, Tanzania, Zimbabwe. Altitude range: 500 - 1500 metres above sea level. Habitat and ecology: Raphionacme madiensis occurs in grassy clearings in open Acacia or mopane woodland, steppic savanna (summit), shrubs and steppe on rocky outcrops, also in deep soils in mountain slopes associated with short grass, in community with Vellozia, Cyphia and Monadenium and Ornithogalum gracillimum, by no means rare, blooms in sheets over this habitat after the first heavy shower. 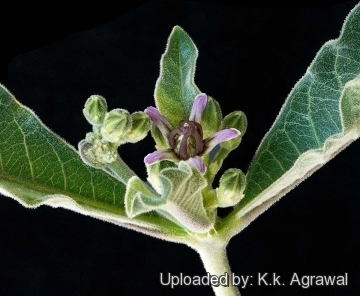 Description: Raphionacme madiensis is a rare caudiciform asclepiad up to 20 cm high, growing from a sub-spherical tuber, up to 16 cm in diameter. It has green and purple attractive flowers, and distinctive very thick solitary fruits. Derivation of specific name: “madiensis” of Madi in Uganda, where the type specimen was collected. Stems: Annual stems one to several, short, 10-16 cm long, erect to spreading, somewhat roughly hairy with much milky sap. Leaves: Opposite, more or less narrowly ovate-elliptic, ovate or obovate, 7-14.5 cm long, green above, paler below, finely velvety with denser indumentum on the much paler veins, wrinkled; margin wavy; petiole 5-20 mm long. Inflorescences: Axillary and terminal, one per node, shorter than adjacent leaves, many-flowered heads, more or less roughly hairy. Flowers: Green/Purple. Corolla lobes spreading, oblong-ovate to oblong-triangular, 5-7 mm long, dull green to whitish-green with brown, pink, magenta or violet streaks, tips or margins. Corona lobes apically 3-segmented; central segment 5-7 mm long, linear to filiform; lateral segments 2-3 mm long, hairless or papillose. Fruit: A single erect follicle, ovoid, 4.5-6 cm long, tapering. 2) «Raphionacme madiensis» in: ‘Liede-Schumann, S. & Meve, U. (2006). 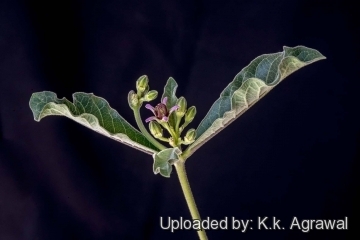 "The Genera of Asclepiadoideae, Secamonoideae and Periplocoideae (Apocynaceae) Descriptions, Illustrations, Identification, and Information" Retrieval. Version: 21st September 2000. http://ttp://www.uni-bayreuth.de/departments/planta2/research/databases/delta_ascleps/index.html’. Cultivation and Propagation: Raphionacme madiensis is a caudiciform plant that grows well in container. Soil: Give the plant a well drained, airy but rich growing medium which consists of non organic material such us clay, pumice, lava grit, and peat or leaf-mould. 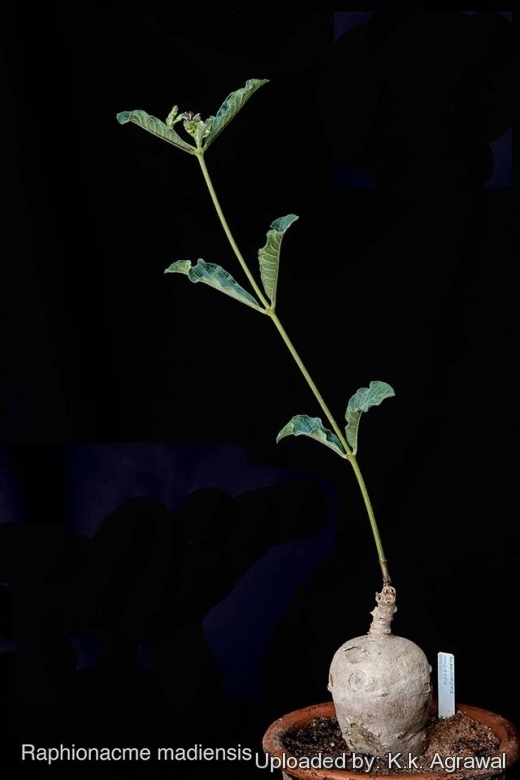 Irrigation: It is probably a summer grower species and need a good deal of water during active growth from spring when the new leaves can be seen forming from the woody neck of the tuber and should be watered only when not dormant. In autumn the leaves begin to go yellow and drop off, so now it rests quite dry in to winter. No water should ever be allowed to stand around the roots. An error in cultivation may produce unsightly holes in the tuber. Exposure: In cultivation the plants are usually grown in semi shade, with the tubers wholly or (preferably) partially exposed to prevent scorching and rotting of the roots. Hardiness: It should be overwintered in the greenhouse at temperatures over 12°C (avoid letting temperatures drop lower than 5° C, but some authors suggest that it can withstand light frost at least for short periods if very dry, in these situations it will better resist if sheltered by the winter rains, seen that the humidity and low temperatures render it more sensitive to rottenness. Plants in containers however, suffered major leaf loss. Maintenance: The dried annual stems need to be removed to keep a tidy appearance. Like quite small pots, repot in very later winter, early spring. Reproduction: Can be reproduced both by cuttings and seeds.